I have totally gotten into kale lately thanks to my friend Tara who kept telling me to make Kale Chips, and man they are so delicious! The broth of this soup I felt had a lot of layers and substance for a veggie soup. 1. Caramelize onions in a large pot. Once caramelized, throw in some chopped tomato, and garlic. Stir and mix with the onions. Season with salt and pepper. After a few minutes pour in 1 container of veggie stock, or use veggie boullion cubes. 2. Drop in the white bean of your choice into the soup. 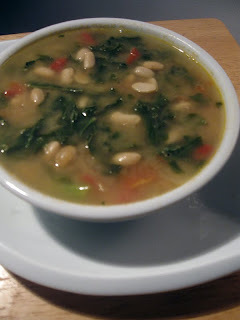 You could mash some of the beans first, to give more texture to the broth of the soup, and then drop the rest in whole. Then add lots of fresh chopped kale. Bring to a boil, and simmer for 20-30 minutes, to make sure everything is cooked through and give the flavours of the soup a chance to meld.